Why haven't you picked up the Season Pass? If you have somehow managed to NOT pick up Borderlands, Borderlands 2, or the Borderlands 2 Season Pass, today is your lucky day. All three items are on sale on the Xbox LIVE Marketplace. The original Borderlands is going for $9.99, Borderlands 2 is on sale for $39.99, and the BL2 Season Pass is available for 1800 MSP, or $22.50. (It normally costs $30.) These prices are available for today only, so buy them now! Borderlands 2 is a strong contender for our Co-Op Game of the Year. It's racking up votes in our Co-Optimus GOTY Community Poll. It also earned our Editor's Choice score in our Co-Op Review. The Season Pass includes four pieces of DLC. Two add-ons have already been released: Captain Scarlett and Her Pirate's Booty and Mr. Torgue's Campaign of Carnage are both excellent additions to the Borderlands 2 experience. 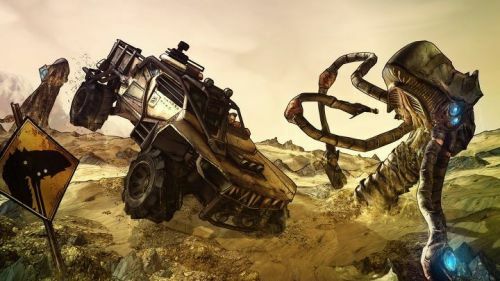 I don't want to tell you what to do with your money, but you should probably forego eating until you've gotten your grubby little mitts on the entire Borderlands collection. Borderlands and Borderlands 2 support two player local co-op and four player online co-op. Borderlands 2 supports combo co-op, as well. If the the hyperlink above and the source link below aren't enough for you, you can follow this link here and get your loot on. Page created in 0.3347 seconds.